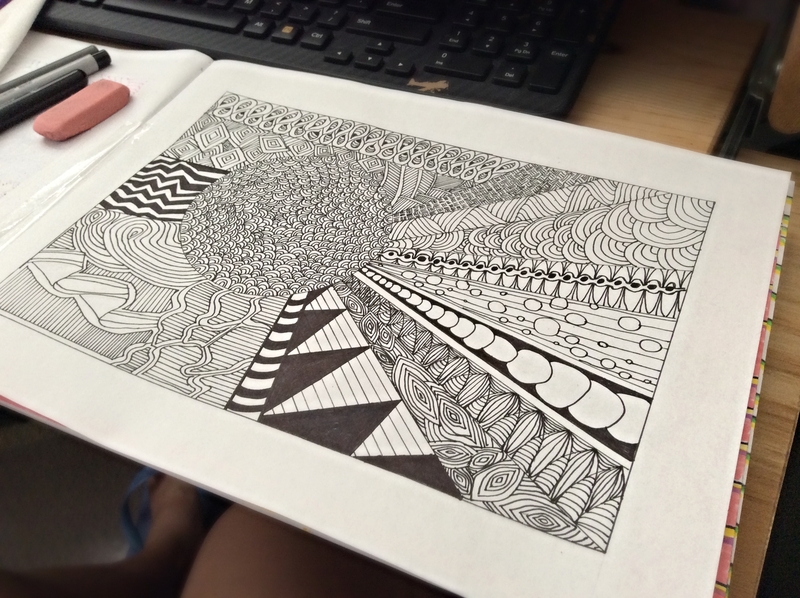 I was looking for ways on how to draw for beginners in Pinterest when, I stumbled upon Zentangle. It’s a free form kind of doodle. Where any shapes and lines can be incorporated to form a beautiful abstract art. I like it because, it soothed my mind. I feel relaxed afterwards. Seriously! I would recommend especially if you have short attention span (like me), to do this in small series. Like in one whole sheet of sketch paper, draw in small square/tiles (or circles) measuring 1×1 inches – 4x4inches (whichever size you like, it’s your own call). The one pictured above made me a little giddy because, I want it finished right away but I got a whole page to fill. It was pretty overwhelming as a beginner. It taught me a lesson to not be too ambitious and should’ve started small. Thus, the next zentangle projects are done in small batches. More of zentangles in another post. What do you to de-stress when you’re at home? I would love to hear about it. This entry was posted in Artsy/Crafty and tagged artsy, at home, sharpie, stress reliever. Bookmark the permalink.